Ever wish you could watch the Weird Al Show again? A new streaming service called ShoutFactoryTV is bringing the cult classic and several others to smartphones, set-top boxes, and the web. ShoutFactory’s library isn’t huge, and much of it’s forgettable, but dig around and you’ll find a few gems, including old Jackie Chan films, episodes of Abbott & Costello, and some classic Twilight Zone. 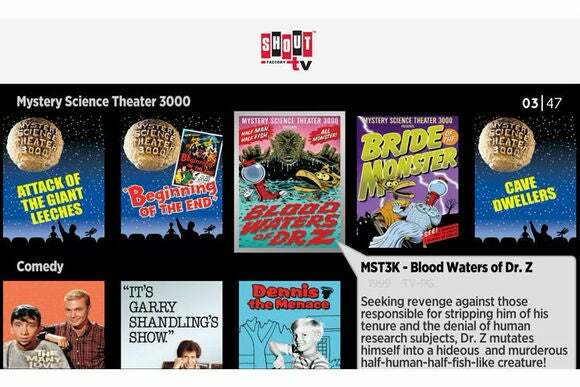 The service also includes plenty of Mystery Science Theater 3000 (and a fair share of B-movies with no parody attached). In any event, ShoutFactoryTV is free and ad-supported on all platforms, including phones and tablets (through any web browser) and set-top boxes (just Roku for now, though a promo video hints at a future Xbox version). By comparison, Hulu requires a Hulu Plus subscription for mobile and TV access. Why this matters: ShoutFactoryTV is just one of several ad-supported streaming services that you can watch through your television, joining other efforts like Crackle, PopcornFlix and channel-specific offerings. While none of them are going to fulfill all your needs on their own, it’s always good to see the patchwork grow a little larger—especially if you’re thinking about cutting the cable TV cord.